June 13, 2018: Healthy Patient. Unhealthy results. Join us for a 2-hour, VETgirl online veterinary continuing education webinar, where Dr. Peter Chapman, BVetMed(Hons), DECVIM-CA, DACVIM, MRCVS, reviews interpretation of routine hematology and biochemistry results. Learn about common abnormalities that may be encountered on routine screening blood work in healthy patients, including how to interpret the results. Learn if it's clinically significant and when you should continue further monitoring or diagnostic workup. Topic: Healthy Patient. Unhealthy results. How do I pay for this webinar if I am a trial member? I can’t see a link for that. I am not ready to be ELITE yet. I’m trying to register for the webinar, but links only bring me to membership sites. 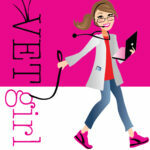 If you are a VETgirl ELITE member, please make sure you are logged in. Once logged in a PINK, register here button will appear.